Norman Kelly is the new coach at Glenavon. Following the departure of Bryan McLoughlin to Ballymena, Gary Hamilton moved fast to secure the services of Kelly who lost his job at The Showgrounds with the sacking of Glenn Ferguson. “I’m delighted we have managed to get someone in so quickly,” said Hamilton. “ Especially someone of Norman’s quality. I know Norman well and I would not bring anyone to the club that a felt would not be a benefit to us. “We have had a number of coaches lately but the boys have adapted well and continued to work hard with whoever has come in. 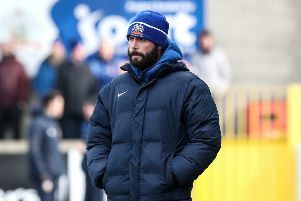 Norman, who had a short playing spell with Glenavon in 2002, won three league titles with Linfield. He comes highly rated and meets the squad for the first time on Tuesday night.